Easter Island is one of the most remote places and most of uninhabited land. One hundred and sixty square kilometers extending in the Pacific Ocean, three thousand seven hundred kilometers from the Chilean coast and two thousand three hundred kilometers of the inhabited the nearest Pitcairn Island. At its peak, it had only seven thousand inhabitants. Yet despite its apparent insignificance, the history of this island is a stern warning to the world. The Dutch Admiral Roggeveen was the first European to set foot on Easter Sunday 1722. He discovered a primitive society of some three thousand people who lived in miserable reed huts or caves, in a state of almost permanent war and forced to cannibalism to improve scarce food resources. When the Spaniards in 1770 officially annexed the island, they found in such a state of isolation, poverty and under-stand that no real colonial occupation was never developed. The population continued to decline and living conditions on the island worse: in 1877, Peruvians took him and rédui-sirent enslaved the inhabitants, except for one hundred and ten old men and children. Finally, Chile laid hands on the island and turned it into a giant ranch for forty thousand sheep run by a British company, while it confined in one small village a few natives still present. soon we walked a range of theories to explain its history. The fancier evoked the visit of aliens or the existence of civilizations lost on continents that sank in the Pacific, leaving any traces this lost island. 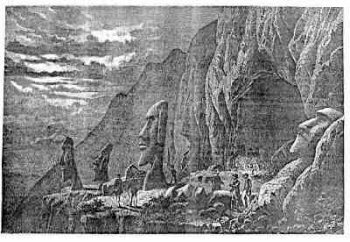 The less extravagant than the Norwegian archaeologist Thor Heyerdahl, argues that very formerly colonized by South American peoples, the island would have inherited a tradition of monumental sculpture and stone work similar to the great achievements Inca and have declined at a later time, under the repeated assaults of other settlers from the west to cause a series of wars between "long ears" and "short ears". But this theory has never unanimous. The history of Easter Island has nothing to do with lost civilizations and esoteric explanations. It is however a striking example of how human societies are dependent on their environment and the consequences resulting from the irreversible damage they cause it. That's the story of a people who, in an unfavorable environment, was able build one of the world's most advanced societies, imposing natural resources available considerable demands. When they were no longer able to bear the civilization that had painfully built up over the preceding millennia collapsed with them. The colonization of Easter Island belongs to the last phase of the long expansion movement of men across the globe during the fifth century AD. The Roman Empire was beginning its decline, China was still in chaos that followed the fall of the Han empire two hundred years ago, India saw the end of the short-lived Gupta empire and the great city of Teothihuacàn dominated almost all of Mesoamerica. Polynesians them, then finishing to address the vastness of the Pacific Ocean. Came from Southeast Asia, the first of them had reached Tonga and Samoa about the year 1000 BC. J.-C. Of the. They were deployed to the east to the Marquesas Islands around the year AD 300, then the v 'in the ninth century, to Easter Island southeast, Hawaii in the north, Society islands and finally New Zealand. This colonization ended, Polynesians were the most widely used people on Earth, occupying a huge triangle from Hawaii in the north to the southwest NouvelleZélande and Easter Island to the southeast: double the area United States today. The discoverers of Easter Island landed on a land with few resources. Of volcanic origin, its three volcanoes were extinct for at least four hundred years to their arrival. The temperature as humidity were high and, although the ground was suitable for cultivation, drainage was very bad, especially as the sole source of drinking water came from the lakes in the craters extinct volcanoes. Very isolated, the island was home to some plants and animals: thirty species of native flora, some insects, two types of lizards and not a mammal. The sea surrounding the island was poor in fish. The arrival of the first humans did little to improve the situation. Animals (pig, dog and Polynesian rat) and crops (yam, taro, breadfruit, banana and coconut) that made the livelihood of their homelands adapting poorly to the harsh climate of their new country, their strength was to be content with a mainly composed of sweet potatoes and chicken diet. Only advantage of this monotonous diet of sweet potato cultivation did not require much effort and largely leaving time for other activities. We do not know the exact number of these early settlers, but he could hardly exceed thirty. The population grew slowly, gradually adopting the familiar social organization in the rest of Polynesia: a large family group, whose members possessed and cultivated in common the land. These closely related families formed lineages and clans, each with their place of worship. At the head of each clan chief organizing and leading the activities, and supervising the distribution of food and other vital products. This mode of operation, competition and probably conflicts between clans that engendered explain the great achievements of the Easter Island civilization as well as its final collapse. The villages stood on the entire surface of the island in small groups of huts surrounded by cultivated fields. Social activities were held in separate ceremonial centers occupied part of the year. The main monuments were the ahu, the vast stone platforms similar to those found in other parts of Polynesia. They served at funerals, ancestor worship and commemorations in honor of the departed leaders. Agricultural production mobilizing little energy, the clan leaders had time to look closely at these religious rites. This feature results in the development of Polynesian society the most advanced of all, one of the most complex in the world with the limited resources available to it. The Easter Islanders share most of their time between the elaborate rituals and the construction of religious monuments. More than three hundred of these platforms were thus built on the island, mainly near the coast. Many of them, built by sophisticated astronomical alignments, oriented towards a solstice or equinox, show a high level of intellectual achievement. At each site rose between one and fifteen monumental stone statues that survive today as the only vestige of the vanished Easter Island society. Carved by obsidian tools in the Rano Raraku quarry, they were designed to represent highly stylized form a male head and torso. The head was crowned with a "bun" of red stone weighing about ten tons from another quarry. The size of the stone was a simple task but lengthy. The biggest challenge was in the transport of these monumental works throughout the island, and their erection on top of the ahu. The solution found by the islanders to this problem provides the key to the fate that subsequently enjoyed their company. Without draft animals, they had to use a very important human labor to haul the statues using rollers like tree trunks. The first small group came to the fifth century, the population of the island is therefore increased steadily to its peak in 1550, 7 000 the number of inhabitants. The island then were hundreds of ahu on which we had set over six hundred huge stone statues. 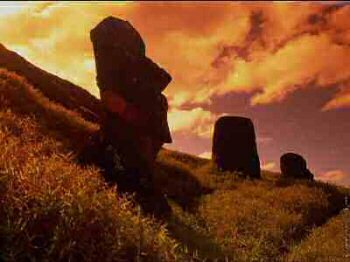 Then, suddenly, this civilization collapsed, leaving behind more than half of the unfinished sculptures from the quarry of Rano Raraku. Deforestation of the island not only sounded the death knell of any social or religious life a little developed: it also had dramatic effects on the daily lives of the population. In 1500 the shortage of trees forced many people to no longer build houses planks but to live in caves and when a century later the wood eventually fail completely, everyone had to fall back on housing cave dug into the hillsides or flimsy reed huts cut from the vegetation from the edge of the crater lakes. More about building canoes: reed boats made it impossible to undertake long journeys. Fishing also became more difficult as the mulberry wood with which manufactured the nets no more. The disappearance of forest cover still impoverished island soil that was already suffering from a lack of fertilizer suitable animal to replace the nutrients absorbed by crops. Increased exposure to the weather worsened erosion and quickly brought down crop yields. Chickens became the main source of supply. As their numbers increased, it was necessary to protect them from theft. But they could not be enough to live seven thousand inhabitants, and the population rapidly declined. From 1600, the decadent society of Easter Island regressed to ever more primitive level of life. Private tree and therefore canoes, the islanders found themselves prisoners to thousands of kilometers from their native homeland, unable to escape the consequences of the collapse of their environment which they themselves were responsible. The social and cultural impact of deforestation was equally important. The impossibility of erecting new statues must have had a devastating effect on belief systems and social organization and question the very foundations upon which was built this complex society. Conflicts multiplied, causing an almost permanent state of war. Slavery became common practice and, as thinned the amount of protein available, people indulged in cannibalism. One of the main objectives of these wars was to destroy the ahu of opposing clans. Most beautiful stone statues were thus gradually slaughtered. Faced with this bleak landscape, facing the ignorance of the islanders who lost over the centuries the memory of their culture, the first Europeans did not understand what a strange civilization could one day flourish on the island. Thousand years, the islanders were able to maintain a lifestyle corresponding to a refined set of social and religious customs that not only allowed them to survive, but to thrive. This is in many ways a triumph of human ingenuity and an apparent victory over a hostile environment. But ultimately, the growth of the population and the cultural ambitions of the islanders proved too heavy for the limited resources available to them. These exhausted, the company was soon to collapse, causing residents to a level close to barbarism. It was enough for these men, totally isolated from the rest of the world one day for a tour of their small island and understand the vital need to create a good balance with their environment. Instead, they exploited it as if the opportunities it offered them were unlimited. Worse, even as the shortcomings of the island became cruelly obvious, the struggle between the clans seems to have intensified: one more carved statues in addition to being transported across the island in a final effort to ensure its prestige, even leave a large number unfinished and abandoned near the quarry, without any regard to the alarming shortage of trees such escalation resulted.